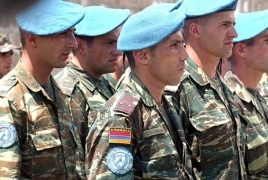 PanARMENIAN.Net - Armenia is taking measures to increase the number of women involved in international peacekeeping operations, the country’s permanent representative to the UN Mher Sargsyan has told a Security Council meeting. Addressing a panel titled “UN Peacekeeping Operations: Women in Peacekeeping,” Sargsyan said Armenia prioritizes women’s involvement in all the spheres of public life in the country. The diplomat weighed in on the Security Council resolution on women and peace and security adopted by the UN in 2000, citing the National Action Plan for the implementation of the provisions of the resolution, which was adopted by the Armenian government in February. Sargsyan stressed the involvement of non-governmental organizations and women-led initiatives in conflict resolution and peace-building activities.